National Black HIV/AIDS Awareness Day was created to help educate the Black community about the basics of HIV/AIDS and to teach what they can do to help prevent the spread of the disease. 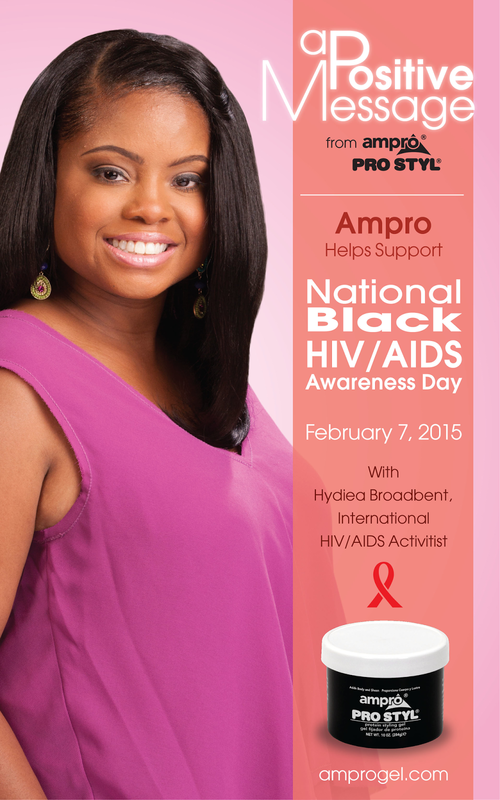 Ampro® Pro Styl® and Hydeia Broadbent are encouraging everyone to grab a friend and head to their local testing facility because knowing one’s status is the first real step to preventing HIV/AIDS. “National Black HIV/AIDS Awareness Day exists as a reminder that we are all accountable for what’s happening in our communities,” says Hydeia, “AIDS is affecting the African American community harder than any other and today is the day where we are accountable for our brother and sisters, a day we hold ourselves accountable for what’s happening.” Hydeia’s message is meant to encourage everyone to take advantage of this day and do something real by getting themselves and a loved one tested for the disease. Broadbent believes that being aware of one’s HIV status will motivate them to have a constructive conversation that will lead to more education and the eventual eradication of HIV/AIDS. “If we work together, we can prevent the spread of this disease,” says Camille Wright, VP of Public Relations for Ampro Industries. “We are encouraged by Hydeia’s strength and urge everyone to use today to do their part to stop the spread of HIV in their community. We must remember "I Am My Brother/Sister’s Keeper: Fight HIV/AIDS!" Ampro Industries, Inc. is a Memphis-based manufacturer of multi-cultural hair care and beauty products focused on the beauty needs of its consumers. Ampro is committed to delivering reliable, top quality hair care solutions for multi-cultural consumers. Ampro products are available in mass market and beauty supply outlets throughout the United States, Canada, the Caribbean, Europe, Africa and South and Central America. The Ampro family of products includes over 18 unique hair care items, including Ampro Pro Styl Protein Styling Gels, America's Number One selling styling gel, as well as its award-winning line Ampro Pro Styl Shine 'n Jams and new moisturizing styling gels. At birth, Hydeia Broadbent was abandoned at the University Medical Center of Southern Nevada in Las Vegas where Patricia and Loren Broadbent adopted her as an infant. Although her HIV condition was congenital, she was not diagnosed as HIV-positive with advancement to AIDS until age three. Now at the age of 30, Hydeia spends her time spreading the message of HIV/AIDS awareness and prevention. Broadbent is considered a pioneer as the first African-American youth to speak up and speak out about the HIV/AIDS epidemic. Ebony Magazine named Hydeia one of the Most Influential 150 African Americans in 2008 and 2011. Hydeia has also been honored with an American Red Cross Spirit Award and an Essence Award. Not since Ryan White has a young person spoken out so passionately, on an international level, about having the virus. She has an innate ability to bond with any audience and, when addressing the public about the issues of HIV/AIDS, her primary goal is to provide a clear understanding of how to avoid at-risk behaviors through self-examination and informed decision-making.